Harbinger- An experienced Belegrim from a realm with no Juggernauts may be granted this rank, bypassing the Cultist waiting period as there are no full members nearby to practice with. Requires 4/5 vote, grants same rights as Acolyte. 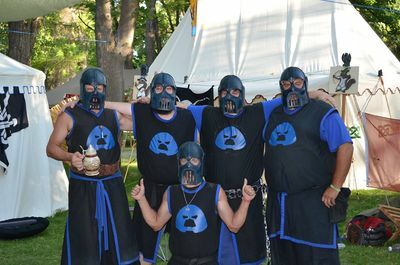 After gaining approval of 4/5ths of voting Juggernaut members, the Cultist may attempt a barrel trial at any event where a majority of active Juggernauts of all ranks are in attendance. Upon completion The Cultist gains the rank of Juggernaut and is formally welcomed into the Unit. Champion- When a follower proves proficiency in their chosen path in accordance to the path guidelines., They achieve a rank of Champion, and may Line their Symbol in Gold. Chaos Lord- The greatest of all the Champions of their path, the Chaos Lord organizes and steers their path towards further greatness, and is responsible for petitioning the Council for promotions of his members. If seen as lacking, he may be removed by the counsel and be replaced by a more appropriate Champion. PRIMARCH- None of you are worthy. Honorary Juggernaut- When a fighter shows him or herself to be deserving, or worthy of merit, who is not one of the Juggernauts, may be dubbed an honorary juggernaut by Council. The Honorary rank functions identical to the Cultist rank but without any of the responsibility. 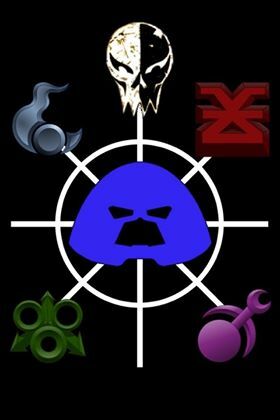 Honorary Members if they chose, may bypass the Cultist rank entirety. Council - The Doomed Ones. The ruling Council of up to 11 Juggernauts. They are responsible for making decisions on page and promotions. While a seat on the Council is highly valued and a great honor, it is completely voluntary. Any decision must be ratified by a 4/5ths majority. To become a Doomed One, one must first claim the rank of Acolyte, and hold at least that rank for a complete season. Khorne “Blood for the Blood God! Skulls for the SKull throne” Those who follow this path primarily wish to fight with, and eventually lead the forces of the Juggernauts. Their goal is to better their own fighting ability above all else. Follower- To become a Follower, one must survive the second round of a regional tournament. Champion- To transcend to Champion, one must lead a portion of the Juggernauts In battle during an event, as well as have overall weapon proficiency in three weapon types, and help another Juggernaut in one of his trials. Chaos Lord- The Transcend to Chaos Lord you must challenge for the rank at any national event and defeat all current challengers for chaos lord and then the Current ranking Chaos Lord in a 1 on 1 battle first to 100 wins with the current Chaos Lord Picking the Fighting Style. If two challengers are fighting a game of chance will determine who picks the fighting style. Nurgle "Buboes, phlegm, blood and guts! Boils, bogeys, rot and pus! Blisters, fevers, weeping sores! From your wounds the fester pours." Those who follow this path are the crafters, the ones who maintain the armory. 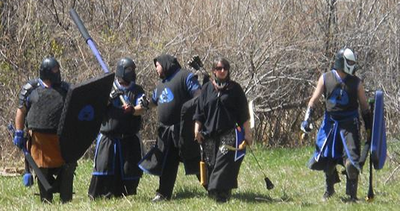 To become a follower, one must be proficient in gear/garb building, as well as assist in weapons check. To transcend to champion, one must create an offering to the armory as well as assist another Juggernaut In the creation of unit garb/gear. The Chaos Lord, maintains the armory, with the help of their champions, as well as advancing the quality of gear/garb. Tzeentch "Do not ask which creature screams in the night. Do not question who waits for you in the shadow. It is my cry that wakes you in the night, and my body that crouches in the shadow. I am Tzeentch and you are the puppet that dances to my tune..." Those who follow this path are the lorekeepers, those who weave the stories and keep the traditions true. To become a follower, one must have his own Geddon page as well as find an (approved) way to add to the Juggernaut lore. To transcend to Champion, one must write a tale of another Juggernauts transcendence , or story of their glory, and write a set of new traditions to add to the Codex. The Chaos Lord guards the ancient tomes as well as approves any changes or alterations. They are also responsible for presiding over Juggernaut trials. A Juggernaut must at all times keep his/her unit in mind while conducting themselves in any official Juggernaut capacity whether inside or out of events. Keeping that in mind we are aware that certain situations may crop up that we need to be prepared for. I am proposing a 5 strike system that works as follows. Strike 4: Confiscation of belt flag and conscription to the "Last Chancers"
All strikes would be voted on by the current council members and a 3/5th's majority would ratify a strike. New offenses can be added at any time by proposing a vote to the current council and ratifying said offense by a 3/5th's majority. As of Battle for the Ring X, the Juggernauts have a cooperative alliance with the Dark Brotherhood, and are welcome in their camps. Likewise, the Dark Brotherhood finds themselves welcome company among the Juggernauts.